The field proven Rugged Power UPS line is ideally suited formilitary, industrial and telecommunications applications requiring a rugged rack,vehicular or field deployable, high reliability, compact size and light weight design. The"1253" is being used by the Bath Iron Works / TANO Corp ICAS project becauseof their stringent performance and reliability requirements. The heavy-duty chassis,occupying only 7" (4U) of rack space and 18.5" depth, has rounded metal cornersand rugged handles front and rear, aiding in safe handling. Internally, all majorcomponents are well secured and electrically insulated to prevent damage due to shock andvibration. The internal shielded input isolation transformer, EMI/RFI filters and input power factor correction minimize both input current and harmonics. 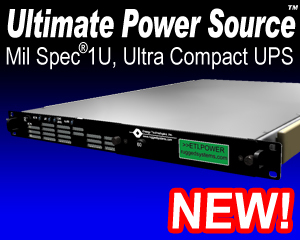 The unitshipboard power as input and converts it to clean,uninterruptible 60 hertz power. The LED arrays keep theoperator informed as to the unit's status including load and battery levels. All controlsand protective devices are brought to the front panel with critical switches having fingerguards. Further, all front panel devices are recessed to prevent damage or accidentaloperation. The input switch and the isolation transformer provide double pole isolationfor shipboard systems. The rear panel provides locking connectors for the input and outputpower. Multipleinput and output power panel options are available. Removable and washable air filters and a high capacity stainless steel ball bearing fans provideadded protection in both controlled and hostile environments. The exhaust air is diverted out the frontvent, with alternateair flow directions optional. The "
ETI0001-1253" has the added benefit of having afield replaceable battery via a rear drawout battery module. The batteries are maintenance free with immobilized electrolyte and are constructed of flame retardant materials. For more information, see the Battery Technology section. The Status connector provides aninterface with optional computer software providing loss of AC and low battery status as well asremote shut down capability.